Until September of 2014, I hadn’t watched Wheel of Fortune since I was a kid. 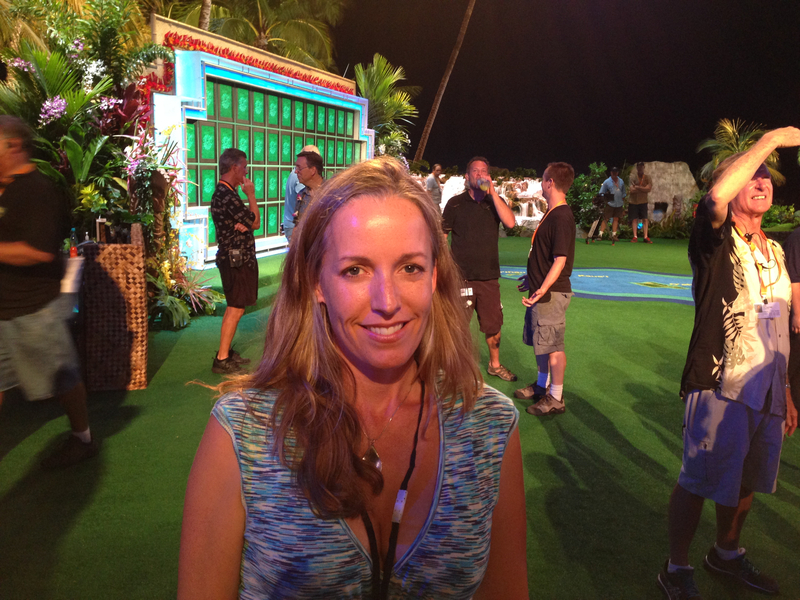 But when my editor offered me a chance to write a contestant’s-eye-view feature on Wheel’s return to the Hilton Waikoloa Village Resort on Hawai‘i Island to tape 20 shows for the 2014-2015 season, I couldn’t say yes fast enough. I spent two days on set, interviewing crew and contestants – including Pat and Vanna – sitting in on a small try-out session and watching 10 back-to-back shows. It was hard not to get hooked solving puzzles and feeling excited for the big winner. Sitting outdoors, looking out at the ocean and hearing the buzz of the crowd was pretty cool, too. On a recent sojourn to Hawai‘i Island, on a whim I took the long drive to the cool, mauka town of Waimea, past green pasture and ranch style houses with a pinching cold belaying blue skies. Dominated by a 1910 residence, the historic home of Anna Lindsey Perry-Fiske, Hawai‘i’s “First Lady of Ranching,” immediately intrigued me. When I finally made time for a tour, I learned it was imbued with more depth than I’d ever guessed driving past it on the main road. Anna’s one-time home, now open for guided tours. The 110-acre property is one of the state’s earliest ranches. It came into Anna’s family in 1848 and remains home to 50 head of cattle. 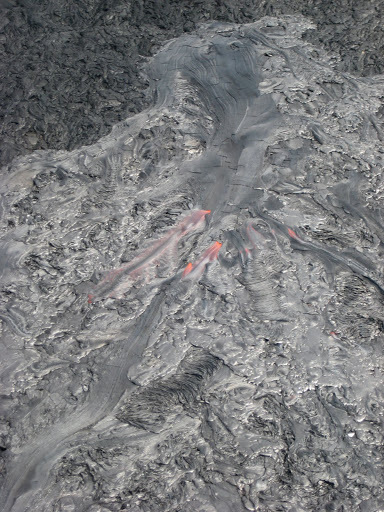 The expansive grounds, which include a grassy volcanic pu‘u, are so picturesque. White cows remaining from Anna’s herd dotted the apple-green pasture under a crisp sky. Delicate white flowers quietly bloomed in manicured gardens. A yellow cat curled around a post near the entrance. And then there were Anna’s white ranch house and outbuildings, frozen in time to reflect the eras of both Anna, who died in 1995 at age 95, and her parents. “Anna wanted everything white,” said Kay Kammerzell, the dynamic former ranch director, after I nabbed a seat inside with a small group at Anna’s gleaming koa table, hewn from one complete wood slab. “She had a white house, white cats, and white cattle.” Her ornate rodeo suits by Nudie Cohn, who made Elvis’ gold lamé suit, screamed that this lady was the real deal. But as the one-hour tour unfolded, Anna’s eccentricities didn’t stand out as much as her unrelenting self-confidence and vigor. A fifth-generation rancher, Anna learned the arts of riding, roping, and tending cattle from a young age, all while being raised as a proper lady of the time. Her accomplishments as a horsewoman, jockey, and cowgirl are undeniable, but her 56-year tenure as manager of her father’s ranch, thriving in a male-dominated business and lifestyle, impressed me even more. 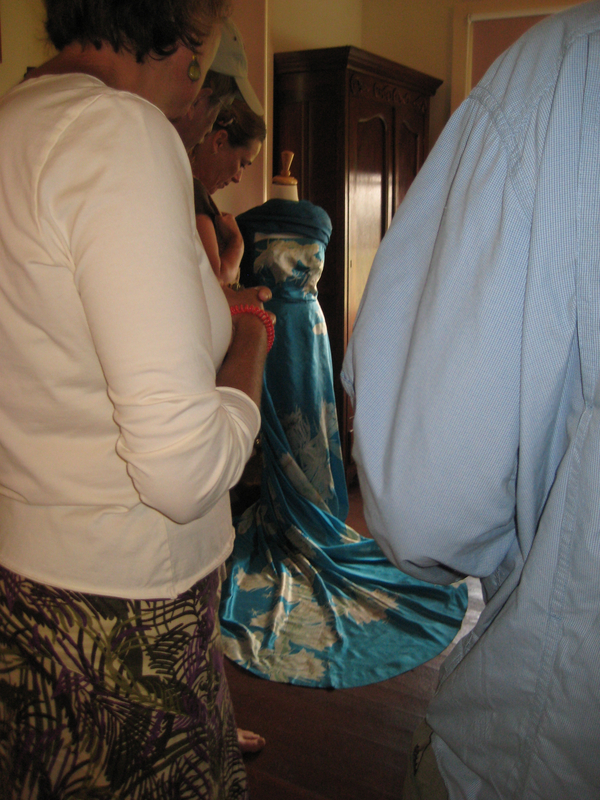 One of Anna’s holoku gowns. “Anna was an innovative cross-breeder,” Kammerzell told us while detailing Anna’s era of management and referring to the white French breed of cows visible in the pasture. “She was the first rancher to bring Charolais cattle to Hawai‘i.” Anna was also one of the first women in Hawai‘i to earn her butcher’s license. She raced horses against men, and was an award-winning pā‘ū rider. Each room in the house, from Anna’s childhood bedroom to her adult office, is as it was at the time of Anna’s death, with belongings that further reveal her individuality and story. I wanted to linger and gaze at prized koa furniture, including an 1800s cleft bench; her lilting Regina music box; turquoise Holoku ball gown; and even a lava rock balancing ball found on property of the sort used to train Hawaiian warriors. But I was especially mesmerized by the saddle room, heaving with old tack and saddles—11 of them vintage—ready to tell the story of countless rides, and the saddle-making workshop, next to the blacksmith shop in the historic barn, where I learned about the ka noho li‘o, the Hawaiian tree saddle. 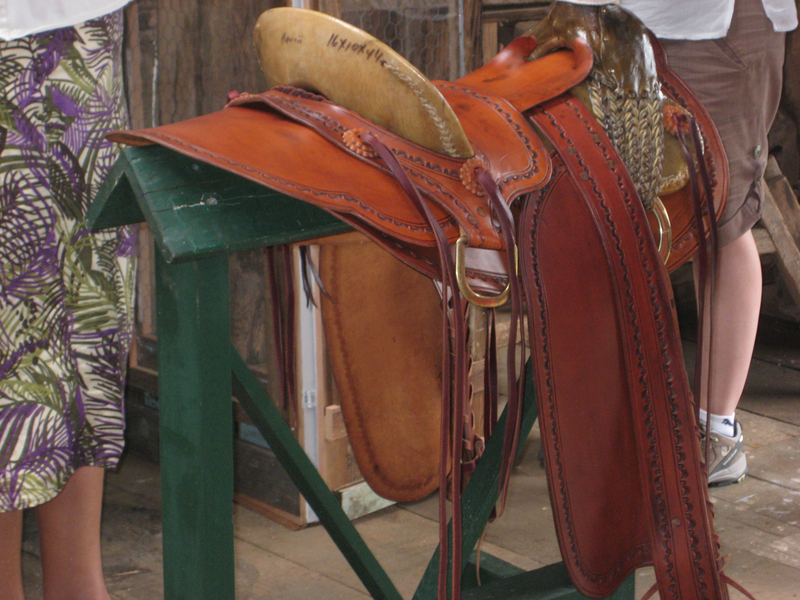 “We want to revive this dying art,” said Kammerzell about crafting this now-rare saddle, originating from the early 1900s and made from wood covered with rawhide. It’s just one way she and the Anna Ranch staff are diligently realizing Anna’s dream of transforming her home into a center for reviving ranching arts and educating younger generations. I knew then that I’d return here with my nieces, who could learn from her remarkable example. More than anything, what stood out as I left is how they’ve ensured Anna lives on in every corner, which means she won’t be forgotten by me or anyone else who takes the time to experience her life and legacy. Visiting Anna Ranch and its grounds, gardens, self-guided Discovery Trail with 20 educational displays, and blacksmith shop is free, Tuesday through Friday, 10 a.m.–3 p.m. One-hour guided tours ($10) of Anna’s home run are given at 10 a.m. and 1 p.m. 65-1480 Kawaihae Road, Kamuela; (808) 885-4426; annaranch.org. Just to the east on Highway 19, the equally picturesque Jacaranda Inn offers another window into ranching history with rooms in former Parker Ranch bunkhouses and a three-bedroom streamside ranch manager’s cottage built in 1897. (808) 557-5068; jacarandainn.com. Forty minutes away, a peaceful hideaway awaits at Hawaii Island Retreat, just outside Häwï. Indulge in their spa, private yoga and meditation studio, and hiking trails on 50 private coastal acres. (808) 889-6336; hawaiiislandretreat.com. For a casual post-tour bite, park your taste buds at Parker Ranch Center’s locally-sourced, gourmet burger joint, Village Burger, run by former Mauna Lani executive chef Edwin Goto. (808) 885-7319; villageburgerwaimea.com. Mexican fare is augmented with several varieties of house-brewed craft beers at Big Island Brewhaus & Tako Taco Taqueria. (808) 887-1717; bigislandbrewhaus.com. Go upscale with global cuisine at nearby Red Water Café (formerly Fujimamas). (808) 885-9299; redwatercafe.com. As the roosters crowed and the December sun poked through Kona’s celebrated puffy white clouds, my roommate awakened me: “It’s clear! Let’s go before everyone on the island is at the top of Mauna Kea.” After a few days of unusually copious snowfall atop the world’s tallest volcano, we—like others ready to take on the reduced atmospheric pressure at its nearly 14,000-foot height—had been awaiting the perfect day to drive to the summit and revel in Hawai‘i’s rarest activity: playing in the snow. The snow report confirmed that the summit road was open, so after packing gear and sandwiches, our quartet set off in a four-wheel-drive Jimmy toward the infamously bumpy and weaving Saddle Road. Ours was one of few cars along this 6,600-foot elevation shortcut between Hawai‘i Island’s Kona and Hilo shores, which straddles the valley between the homes of two rival Hawaiian goddesses: Poli‘ahu, whose icy cloak rests on Mauna Kea’s wintry slopes, and Pele, who sometimes alights inside the more fiery volcano Mauna Loa. 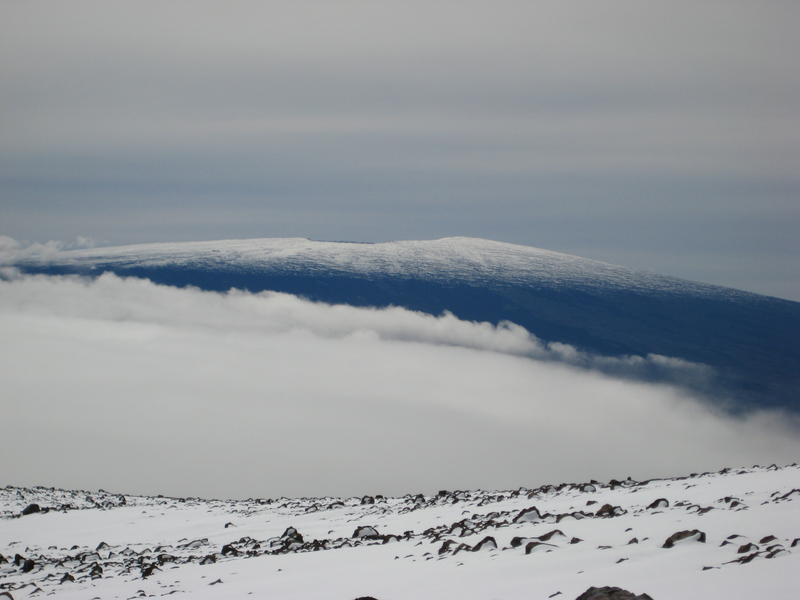 As we drove past mossy pastureland and then brittle ‘ōhi‘a forests, Mauna Loa’s rounded, snow-dusted peaks beckoned, while Mauna Kea’s spiny profile practically dared us to ascend. About an hour later, we turned onto Mauna Kea Access Road, easily scaled on a paved slope laid down amid barren rock. Yet even this unforgiving landscape houses hearty flora and fauna. We spotted endangered silversword, māmane trees, diminutive francolins, and endemic ‘ōhelo shrubs and berries, a favorite treat of the nēnē. Just 20 minutes after that, we arrived at the Visitor Information Station and stepped into the brisk air at 9,300 feet. The station’s website recommended at least a 30-minute stop to acclimate to the high altitude before going up. Visitors without a 4WD vehicle shouldn’t go farther, but that doesn’t mean there’s nothing to see. We looked at the interactive displays and watched a film about Mauna Kea. The website has more information about hiking and nightly public stargazing. We were eager to arrive at the top before the crowds and afternoon clouds, and after donning warmer layers, we soon began the slow drive up the steep and gravelly summit road. During the eight-mile journey, there was plenty of time to photograph breathtaking views around each switchback. 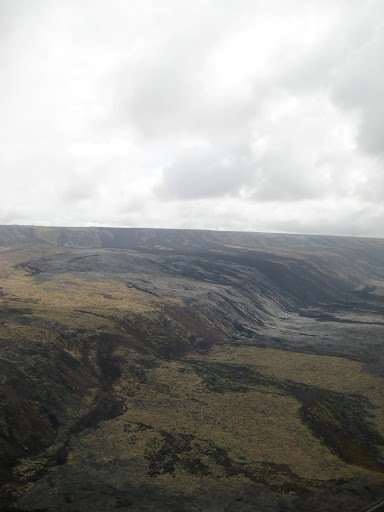 At 12,000 feet, a thick blanket of snow covered the site of an ancient Hawaiian adz quarry—the largest primitive quarry in the world—and its ancient heiau, petroglyphs, and hiking trails. From then on, all was white until we began to see parked cars lining the roadside, and we stopped near shiny silver observatory domes bathed in potent sunlight. My fingers burned with cold and my head ached as if I’d worn a too-small hat, but the island’s highest 360-degree view provided an arresting distraction. Visibility was so clear. I peered down to lush green Waimea pastures, out across a broad moonscape of cinder cones, and across the sea to Maui’s Haleakalā. As we unloaded our sleds and snowboards, watching others throw snowballs or pile snow into truck beds to bring home, I marveled at this otherworldly place. It resounded with an almost tangible spiritual presence that commanded respect, yet it was still so close to home. 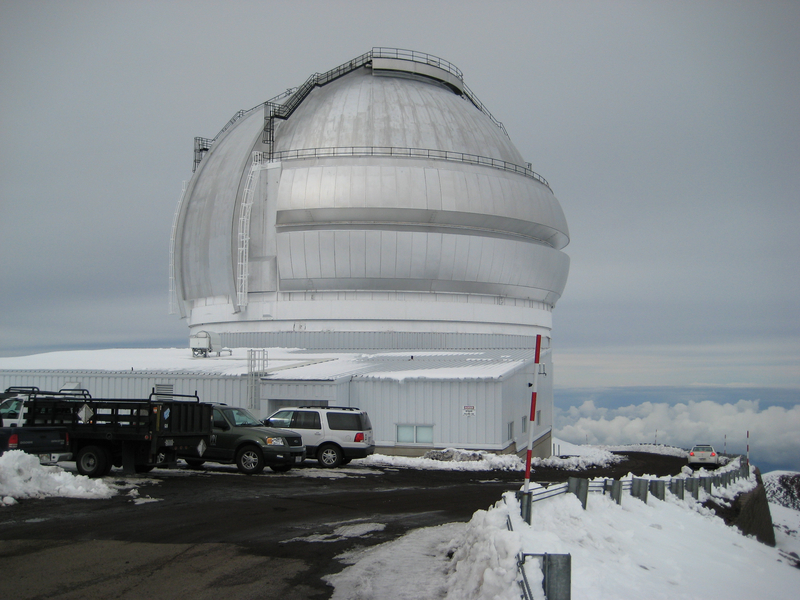 Hawaiians believe heaven and earth connect on the summit of Mauna Kea. Standing tall on its snowy peaks that day, it was easy to understand why. 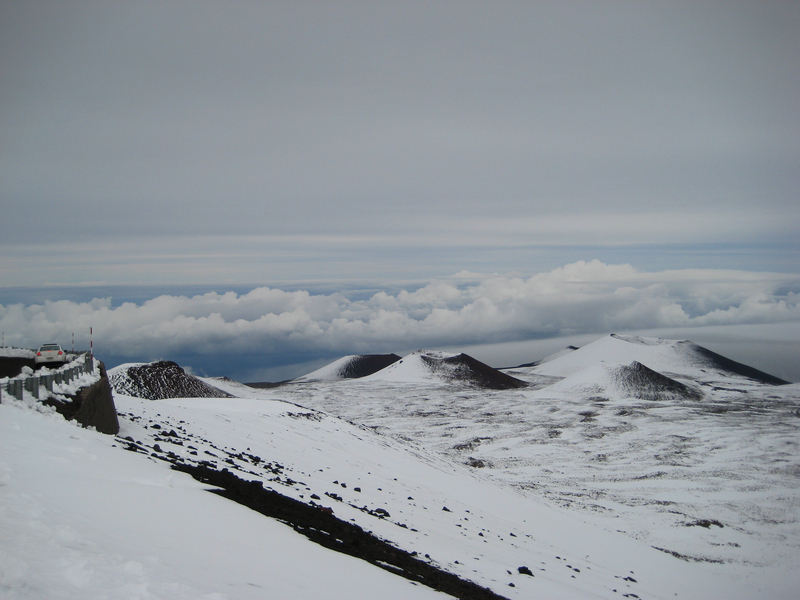 Drive to the summit: Call first for road conditions (808-935-6268), then take Saddle Road (Highway 200) from Hilo or Kona (via Highway 190) to Mauna Kea Access Road. Stop and acclimate at the Visitor Information Station, open 9 a.m.–10 p.m. daily. From there, continue solo in your 4WD vehicle, or join a Summit Tour 1–4:30 p.m. on weekends. A list of recommended commercial tour operators is available on the website. Mauna Kea is accessible from both sides of Hawai‘i Island, so take your pick. Experience the understated elegance of the Kohala Coast’s newly renovated architectural gem, the Mauna Kea Beach Hotel (rates start at $360; 62-100 Mauna Kea Beach Drive, 866-977-4589), and swim in the calm aquamarine waters of Kauna‘oa Bay. 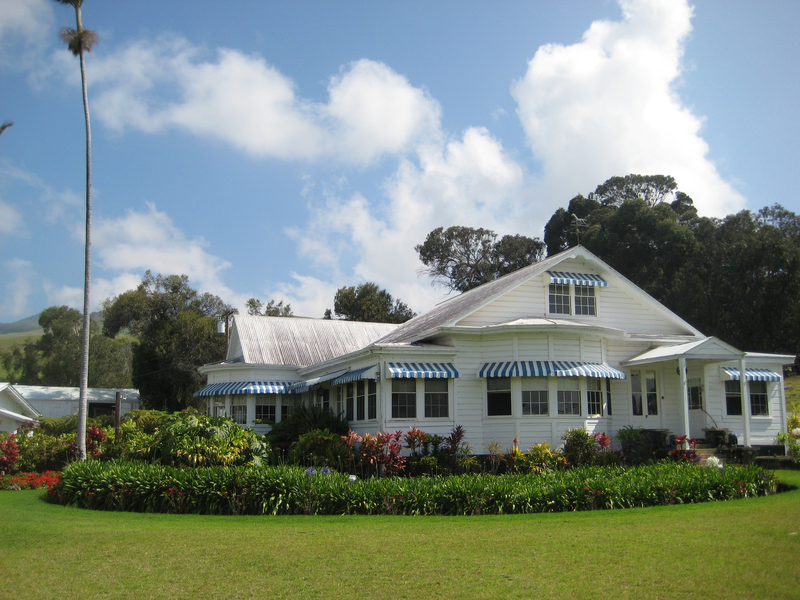 In Hilo, be transported back in time at Shipman House Bed & Breakfast (rates start at $209; 131 Ka‘iulani Street, 808-934-8002), a landmark historic home operated by a fourth-generation Hawai‘i family. I just returned from a spur of the moment trip to the Big Island and was lucky to attend a few events at this year’s Kona Coffee Cultural Festival. It reminded me of when I wrote about its 40th anniversary in 2010. It’s only getting better as it ages and it’s on until November 12, if you’re so inclined. Here’s a peek of my feature on the anniversary. Nearly one-and-a-half centuries later, coffee has reached a pinnacle on par with neighboring Mauna Kea. Kona is now all but synonymous with coffee, and for 40 years residents have celebrated these handpicked gourmet beans at the Kona Coffee Cultural Festival. Mirroring Hawai‘i’s multicultural society, Japanese, Native Hawaiians, Europeans, Chinese, Portuguese, Filipinos, and others have played important roles in fostering Kona’s coffee culture and lifestyle since 1828. And today, most farms remain traditionally small and family-owned and operated—such as Sakata’s farm, planted by his grandfather 120 years ago. This year’s 40th Annual Kona Coffee Cultural Festival, set for November 5–14, will again commemorate the traditional harvest, coffee pioneers, and today’s coffee industry. It’s a milestone for Hawai‘i’s oldest food festival, and, until the Ka‘ū Coffee Festival launched last year, the state’s only coffee celebration. Farmers, residents, and visitors mingle at nearly 50 volunteer-run events spanning 10 days, including coffee cherry picking and art competitions, farm tours, and, a farmer favorite, the Hōlualoa Coffee & Art Stroll featuring estate coffee tastings. The festival’s international sponsorship and media spotlight also provide unmatched promotional opportunities for Kona’s approximately 600 coffee farmers. Ueshima Coffee of Japan sponsors the picking contest and the Miss Kona Coffee pageant, which awarded Miss America 1992 Carolyn Sapp her first crown. Sweden’s Gevalia, a 15-year sponsor, puts on the highlight event, the Gevalia Kona Cupping Competition, for which Bateman is a roaster. Growers submit at least 50 pounds of parchment (dried coffee beans) from the year’s best crop to enter the Classic Cupping Competition. The Crown Cupping Competition requires 4,000 pounds of parchment and is also open to millers and processors. After blind judging by a global cupping panel, winners of both competitions earn bragging rights, but Gevalia also promises to buy 3,000 pounds—worth around $36,000—of coffee from the Crown winner for its customers. Resting on that foundation, the festival has steadily expanded into an influential cultural and community fixture. Whether farming for generations or just starting out, coffee growers in this fertile district—likened to Napa’s wine region with subtle, detectable differences in terroir from farm to farm—know that the festival helps everyone and feel privileged to be part of it each November. “In any society, the farmers are always on the bottom of the totem pole. But when it comes to the festival, they’re on top, and we build the program for them,” says Sakata. If you’re a writer and reader on the Big Island, or need a good excuse to fly over for a getaway, I’ll be giving a series of readings and talks for DON’T LOOK BACK: Hawaiian Myths Made New from Saturday 2/25 – Tuesday 2/28 in Hilo, Kona & Volcano. Joining me will be DON’T LOOK BACK contributor and nationally bestselling author and Waimea resident Darien Gee (Friendship Bread: A Novel ) who also writes under the name Mia King (Sweet Life ). We’d love to see you there! Tell your friends, bring your friends, and anyone who loves stories, Hawaiian culture, myths and more. Saturday 2/25 at 1 pm we will be at Basically Books in Hilo reading from our stories and signing books for about an hour. Sunday 2/26 from 2 – 4pm we will be reading and talking story at a special edition of Kona Stories‘ “Wine & Words” event in the Keauhou Shopping Center on the Kona side. A little wine and pupu, stories and books make for a great, storied afternoon. Tuesday 2/28 at 7pm we will be the featured presenters at Hawai‘i Volcanoes National Park “After Dark in the Park” event in the visitors’ center. 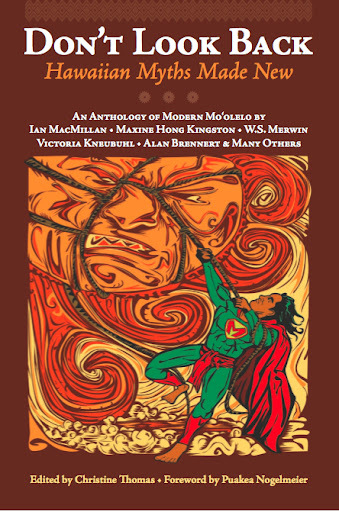 We’re hoping for a spirited evening as we honor Pele with Darien Gee’s story Pele in Therapy (think about those times when one has the need to “vent”), and my riff on The Legend of Halemano. There are actually five stories in the collection where Pele’s influence reverberates and her powerful presence in our modern lives is honored. I hope to see you there. And O‘ahu people–we’re planning a talk story event soon in Honolulu for those that want to discuss myth and retelling in more detail. 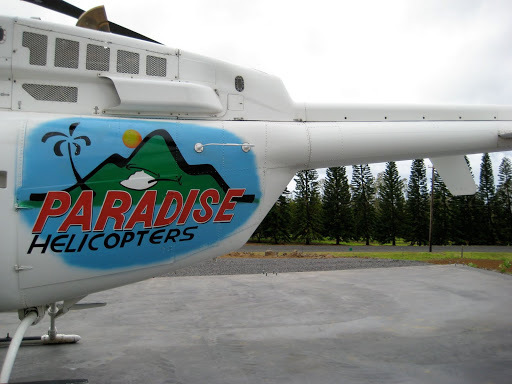 Earlier this month I posted a sneak peak of my awesome Paradise Helicopters Tour from Ka’u to Hilo (I say awesome again, though I banned myself from describing anything with that word because I said it too often during our flight). As promised, here is a more detailed look into the hour-long tour. 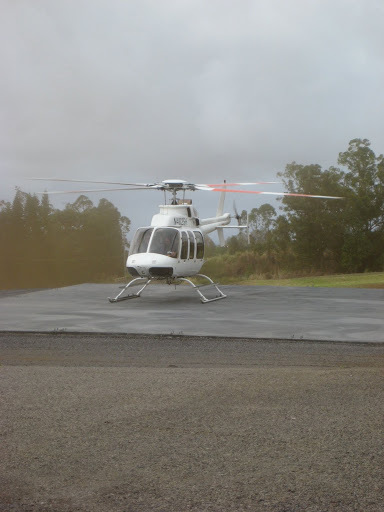 I boarded the ‘copter at the new Ka’u Coffee Mill. The visibility was poor that day because of rain and that dreaded word that rhymes with dog, but luckily it cleared up, just for us. After we strapped on our safety packs and Paradise President Cal Dorn led us through a pre-flight safety brief, we were on our way. I and my fellow passengers donned our miked headsets, which muted the noise and allowed Cal to very naturally explain what we were seeing. I could also speak to Cal through my microphone as well as to my fellow passengers which made for a fun and naturally interactive tour. 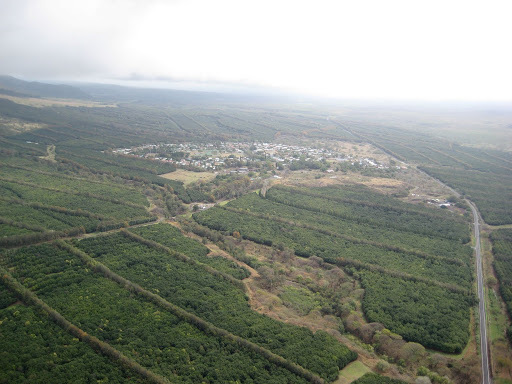 First we cruised over the Ka’u coffee and macadamia nut farms, viewed the fast-growing commercial eucalyptus forest, and then had a rare glimpse of Pahala town, surrounded by macadamias. 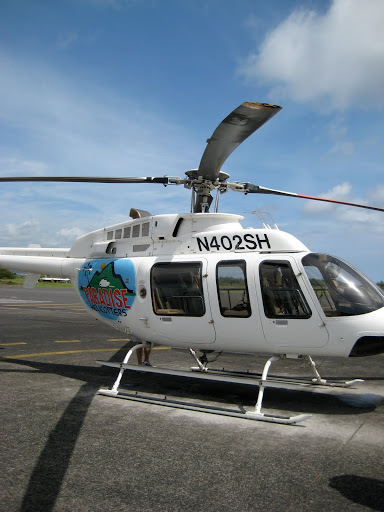 Then we were off to the lava, an experience which transformed me into a helicopter tour believer. Never before had I seen the transition from old to new land in such a sweeping way, clearly viewing old and new flows that once poured into the sea and shaped this portion of the Big Island. 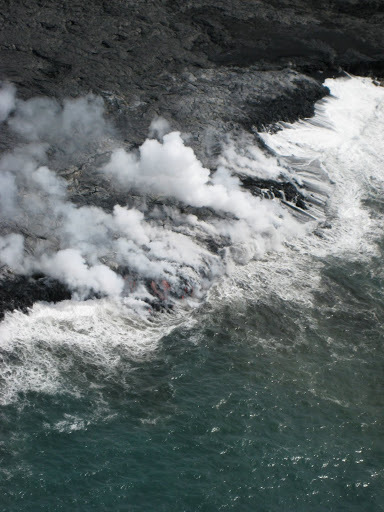 Just a few days earlier, on April 30, lava was reportedly flowing into the sea at Kalapana, and from a distance you could witness the steam rising in a plume and heading mauka as if it were a beacon. As we flew closer, through crashing waves a crimson glow could be glimpsed (better with the eyes than with a camera shutter), and a shelf of black lava pounded by fire and water rested beneath us. It was simply captivating. The charred land and aquamarine sea were enmeshed with ivory steam; the surrounding land lay quiet, burning in silence underneath. 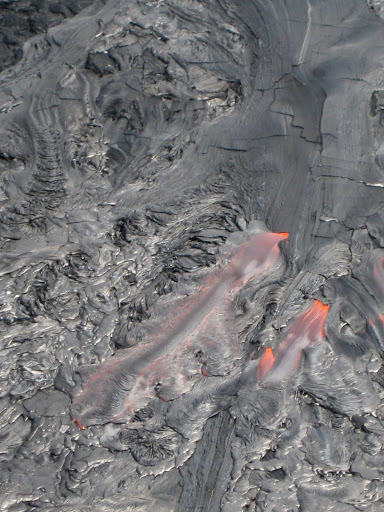 As we flew toward Hilo we luckily caught a burst of molten lava as it began pouring onto a silvery lake of recent flows (that was in my sneak peak). Had Cal not been there at that time, we’d never have known it had just happened. 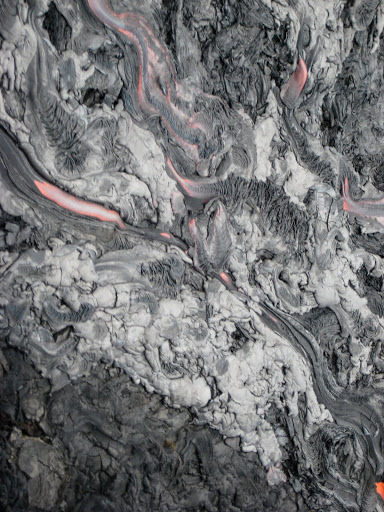 We scouted the area looking for more bursts, and I was able to capture these smoldering veins as we inhaled the sulfur and felt the heat for a few seconds more. 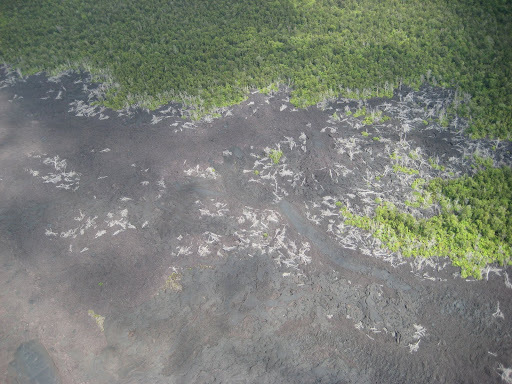 Soon the lava “gave way” to green as we crossed over the Hilo rainforest. 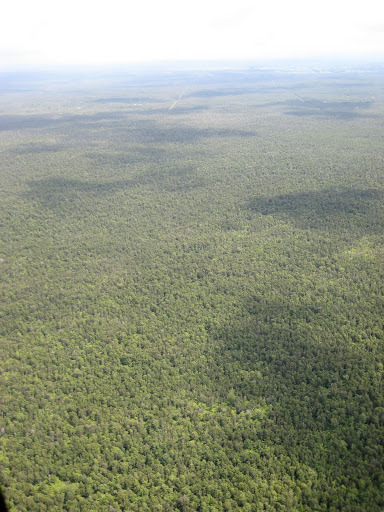 I had no inkling of how broad its reach, and how avocado green its canopy. An hour passed in a blink, and we arrived at Hilo airport with a seamless landing. Having flown planes as a teenager, I was dying to get into the cockpit, which the kind Cal allowed me to do–just for a moment. And then I was off to my next adventure–a volcano park tour guided by the humble and knowledgeable Warren Costa of Native Guide. But I made a promise to myself to get up in the air again as soon as I could–preferably with Cal as my pilot. 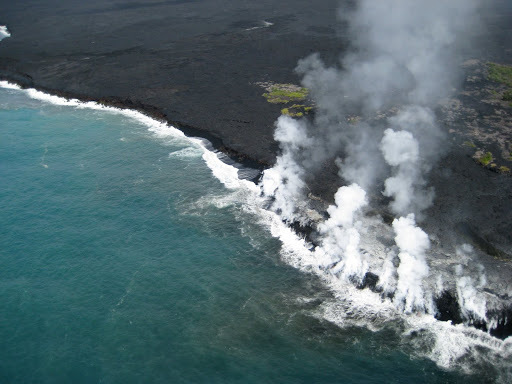 A sneak peak into my recent Hawai’i Island adventure–getting up close and personal with Kilauea via Paradise Helicopters and its wonderful pilot and President Calvin Dorn. 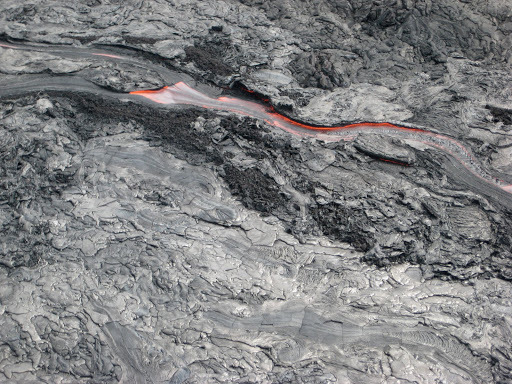 This little lava river broke out just as we happened to be flying above it. I could feel the heat as I stuck my little point and shoot Canon Powershot out the copter window and snapped this shot. What a beauty!